More and more websites are monetizing their users via in-browser cryptocurrency mining. Instead of showing intrusive adverts, the site instead takes advantage of the user’s CPU power to solve mathematical problems, which are then used to create valuable digital coins. This is called “cryptojacking,” and it isn’t particularly great for users, who find their machines become inexplicably sluggish. 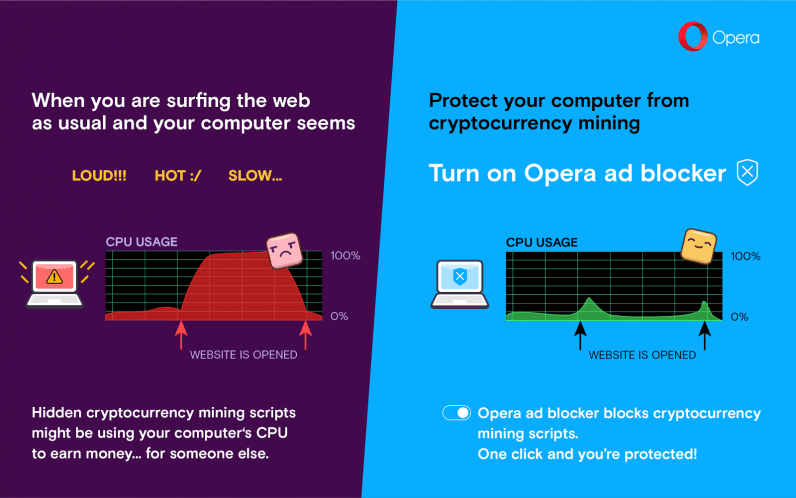 Mercifully, the latest version of the Opera browser comes with built-in protections against cryptojacking. Opera 50 uses the No Coin list, which is updated regularly as new mining scripts emerge. To activate it, simply turn on the browser’s built-in adblocker in preferences. If you wish to view adverts (some websites take a dim view on adblocking) but want to protect yourself against cryptojacking, simply tick the “No Coin” box. It couldn’t come at a better time. Cryptojacking is a worrying trend. A study from AdGuard published in November 2017 found that 33,000 sites used crypto-coin mining scripts as a monetization tactic. AdGuard estimates that these sites reach as many as one billion people each month. And it’s only getting worse. AdGuard looked at the 100,000 most popular websites (according to analytics firm Alexa), and discovered that the number of sites using cryptojacking is growing 31 percent month-on-month. Opera has the distinction of being first browser to address the issue by adding built-in cryptojacker protections, but I doubt it’ll be the last. Starting from February 15th, Google Chrome will come with an integrated ad-blocker. This was largely a response to widespread consumer malcontent at the state of the online advertising industry. As the general public become more aware of cryptojacking, you can expect them (and other browser developers) to follow suit. Opera 50 is available from today, and you can download it here.